When deciding on the size and style of wedding book or album, there are more options than a bride could ever imagine, but we took the guesswork out to bring you a product that will last for generations. There is no better way to tell the story of your wedding day than with an album. This is more than a record of moments, it is the heirloom piece that makes a statement in the home, and a treasured keepsake will remain in your family for generations. The books are created on the highest quality equipment by talented artisans who mix the right amount of "schmooze" and science to deliver products that take your breath away. Coffee Table Books make up our most popular line of albums. They are extremely versatile, with lots of colors, finishes, and cover options. These books tell the story of your day in a way that allows to relive it again and again in glorious detail. Our albums are built to last. Pages are printed on archival Luster-coated paper that resists moisture and fingerprints, mounted to a mattboard backing to add rigidity and longevity. The spines are stitched, not glued, ensuring they will outlast every turn of the page. Gone are the days of the cookie-cutter wedding book. 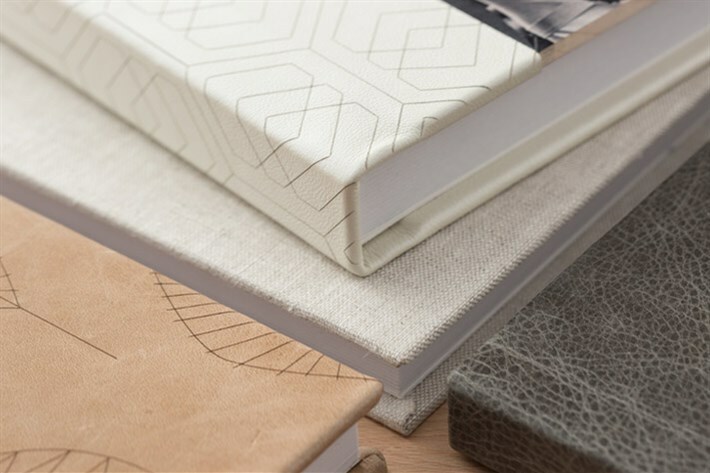 While traditional leather-bound books are still very popular, you can get creative with unique colors, accent them with cameo cutouts, choose an etched pattern, or add a printed wood veneer or acrylic overlay. The sky is the limit! The designs are done all in-house, so you know you’re getting a story flow that matches what happened on the wedding day. The layouts are sleek and polished, and seams are sealed for visual continuity between pages. Digital to Delight. Album to Archive. Digital images are certainly an enjoyable means of reliving your wedding day, but as current technology quickly becomes obsolete and file formats deteriorate or change over time, there will be a time in our future that "the cloud" will fail us in some capacity. Do you really want to risk the most beautiful photographs of one of the most important days of your lives, not to mention memories that you have invested a lot of time and money into, to an uncertain digital future? You can read more about the importance of the album in this article. Consider instead enjoying the digital files and all their modern technological features with friends and online acquaintances, then displaying your beautiful album in your home for family to enjoy for generations.